I’d thought this book came out way more than two years go? I got quite the surprise when I flipped to the copyright page and saw that Neil Gaiman’s Norse Mythology came out in 2017. When the book came out, I remember seeing tons and tons of hype, gorgeous cover art, and being so buried in Marvel Thor movies that the last thing i wanted was more Thor fiction. When my friend lent me his copy of Norse Mythology, I ran my hands over the embossed cover, tried (and failed) to find constellations in the scattering of stars, and thought to myself “yeah, I’m finally ready for some Thor fiction”. Thing is, and and I’m so pleased to say it, this is not “Thor fiction”. This book is literally what is says on the tin – this is not reimagining of Norse myths, or retellings, or modern takes on them. Gaiman studied the Poetic Edda and the Prose Edda, read the commentaries, and dug into the dusty, cobwebby corners. He sought to understand where these stories may have come from, how they may have evolved over the centuries, he mourned what has been lost because it was slowly forgotten through the oral tradition and never written down. This volume is a selection of Norse myths, told in Gaiman’s signature style of deceptively simple prose that pulls you in, and just keeps pulling. His introduction alone is a brilliant piece of writing. 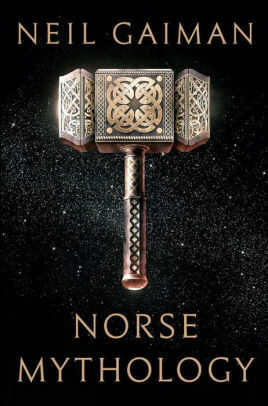 If you have ever read Edith Hamilton’s famous Mythology (ok, so it isn’t Norse), and wished for something a little easier on the eyes, something that didn’t assume you had already studied for years, something that was a joy to read, Neil Gaiman’s Norse Mythology is for you. Told as short stories, Gaiman starts you with the birth of the Gods and Goddesses, and takes you all the way to Ragnarok. The stories happen chronologically, so once Thor is gifted with his hammer, he has it in future stories. Once Frey gives up his sword in payment, he never has it again. Once Balder is dead, he’s dead. Once it becomes known that Loki has other children that Odin didn’t previously know about, those children become part of the mythology for the rest of time. Once Loki loses the trust of his fellow immortals for the last time, there is no escape for him. And Thor is . . . nowhere near as smart as certain movies would have you believe. This was the perfect bedtime book. None of the entries are very long, they functioned perfectly as something to read to calm my brain down. Keep in mind tho, that due to the stories being in general chronological order, it’s best if you read them in order. Treat this book like a mosaic novel made up of various smaller, interlinked stories (wait a minute, is this a fix up novel? lol! ).